Tape storage drives may have been around for 60 years, but they’re still breaking records. Working alongside the Sony Corporation, IBM Research has been able to store 330 terabytes of uncompressed data onto a prototype cartridge small enough to fit in the palm of your hand. That's six times more storage than the world's largest hard drive. 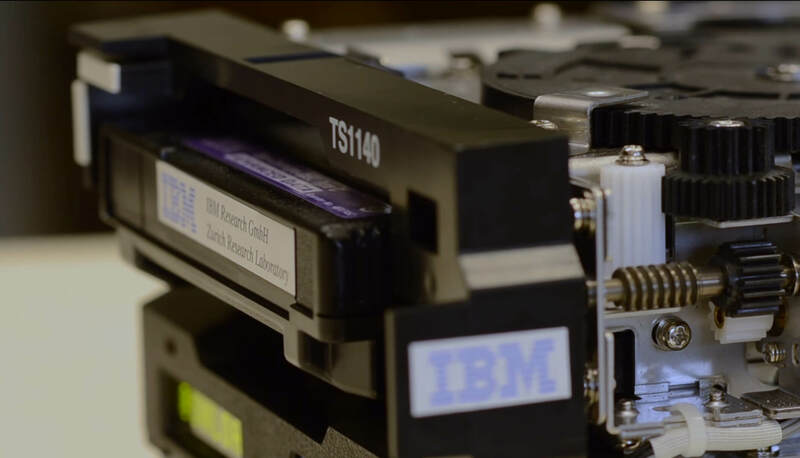 This is the fifth time since 2006 that IBM Research scientists have set a world record in tape storage. Called sputtered magnetic tape, it’s able to store 201 gigabits per square inch. That’s more than 20 times the areal density of current commercial tape drives. Areal recording density refers to the amount of information that can be stored in a given area of surface. The milestone was announced by both companies at the 28th Magnetic Recording Conference in Japan today. The record is unlikely to stand for very long, as IBM says "storage on tapes will continue to scale up for another decade." The sputtered tape was developed using low friction tape head tech, advanced servo control technologies, and new signal-processing algorithms, which are based on noise-predictive detection principles. Sony developed a low-friction lubricant technology for high-capacity writing and high-speed reading. IBM and Sony have been working on increasing areal recording densities for many years. “The results of this collaboration have led to various improvements in the media technology, such as advanced roll-to-roll technology for long sputtered tape fabrication and better lubricant technology, which stabilizes the functionality of the magnetic tape,” said IBM fellow Evangelos Eleftheriou.